Food retail in India is here to stay. We have seen how the markets have evolved in the developed economies. The same is bound to happen in India. In the long term, people will cook less and less at home and will move towards dining out for everyday food and not only for experience and entertainment. India is a multicultural land that has people belonging to different religions, cultures and beliefs coexisting in harmony. Almost every region offers cuisine that is distinct and different from the other. The restaurants in India are not only reputed for traditional Indian cuisines but also cuisines from different places in the world. Starting from high end restaurants to road side dhabas, the Indian restaurants just cater one thing and that is good food. The organised quick service restaurant (QSR) industry in India is still in a nascent stage but growing. High economic growth is leading to greater disposable incomes, busy lifestyles and increased spend on eating out. QSRs address an important need of the customer and this segment is expected to be one of the fastest growing in food sector. While most of the QSR concepts in India are western, brought in by multinational corporations, very few companies are attempting to build scalable concepts in Indian food. No matter what your tastes are and what your budget is you can have food of your choice in an Indian restaurant. The organised QSR sector is estimated at around Rs. 4,000 crores growing at 25%+ p.a. It still constitutes only 5% or less of the total QSR industry in the country, which is dominated by unorganised players. Dotted throughout the country are the many Indian restaurants. Specialty restaurants form an important part of the Indian restaurants. There are a number of specialty restaurants in India which mainly aims at offering world class cuisines at an affordable price. 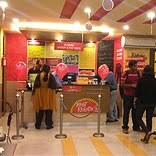 Besides specialty restaurants, fast food joints throughout India are also witnessing an increasing demand. The rapid growth of the Indian restaurants can be attributed to the varied gastronomic habits coupled with the diverse assortment of cuisines and different cooking styles. One such name that comes to mind is Kaati Zone, as the name suggests it’s a joint where you can have your delicacies in the roll menu. As highlighted by Mr. Kiran Nadkarni, CEO, Kaati Zone “Kaati rolls are staple food in most parts of our country (roti and sabji). Our food is moderately priced and is served in quick time. The demand for such food is very high among people on the move in different environments” . With modern age IT professionals & other office-goers, the hassles of lunch are quite a problem. So when people say they prefer lunch on the move or having somebody delivered to them, that more or less solves their issues. “The demand is fairly straight forward. We did not have time to cook and could not afford to dine out at expensive places each day. People are pressed for time. They need good food which they can comfortably eat on an everyday basis, thus we started Mast Kalandar” says Mr. Gaurav Jain, CEO, Mast Kalandar. A kiosk store requires investment of Rs. 7-10 lacs whereas small dine-in stores may cost Rs. 15-20 lacs. Home delivery is a major attraction of these kiosks. The manpower requirement ranges from 5-6 for kiosks to 10-12 for dine-in outlets. The operation of stores is quite simple and can be handled by semi-skilled operators. Normally you will require trained staff of upto 15 people for a single unit. These stores require low investment, have low fixed overheads and provide attractive returns to franchisees. This business model works in large metropolitan cities as well as tier-2/tier-3 cities, and is viable both in short-term and long-term. Thus, players in this area have a huge opportunity.